Social media including popular forums, blogosphere, and social networks has evolved tremendously in recent decade and we can witness the proliferation of many successful services and applications: Twitter, Flickr, Youtube, Facebook, Hyves, Livejournal etc. Data generated but lots and lots of users of these applications allow for many interesting studies that were hard to imagine before. How social media is produced, cited and used; how various information propagates being searched and found, how social communities evolve, what people talk or argue about, what opinion people have - these and many other questions are interesting to academia and businesses. Social media mining is aimed to facilitate traditional and new kinds of search, recommendation, and predictive modeling tasks. 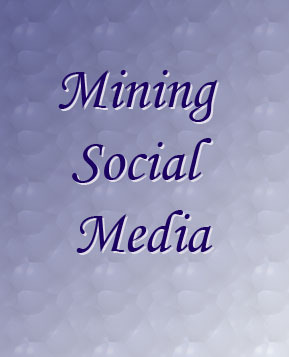 In the recent past we studied several topics related to social media mining. Murat Ongun in his thesis Utilizing Social Media Data for Search Engine Marketing studies how to align streaming data from the social media with web analytics data and facilitate its mining for different search engine optimization tasks including additional keyword generation, finding patterns related to geographical regions and trends detection for managing keyword bids. Samuel Louvan in his thesis Web Page Segmentation & Structure Analysis for Eliminating Nonrelevant Content studied how to identify relevant content in social media websites including blogs and forums. Most of the previous approaches used heuristic rule sets to locate the main content. Our contribution in this work is mainly the development of web content extraction module which uses a hybrid approach that consist of machine learning and heuristic approaches developed by Samuel, namely Largest Block String, String Length Smoothing, and Table Pattern. According to our experiments, the combination of machine learning and heuristic approach gives encouraging result and it is a competitive content extraction method compared to the current state of the art web content extraction methods. E. Tromp and M. Pechenizkiy. Graph-Based N-gram Language Identification on Short Texts. Benelearn 2011. Chambers, L., Tromp, E., Pechenizkiy, M. & Gaber, M. Mobile sentiment analysis, KES 2012. CINLP_datasets.zip (description.txt) Preprocessed labeled Twitter datasets, one automatically annotated and two manually annotated as used in Tromp et al, 2013, submission to CINLP special issue. Turkish_Movie_Sentiment.zip and Turkish_Products_Sentiment.zip (descpription.txt): Movie reviews and multi-domain product reviews (both in Turkish) dataset as used in Demirtas & Pechenizkiy, WISDOM@KDD'13 (cross-lingual polarity detection with machine translation).